During the last two days I have recorded 29 Brambling passing through or stopping off in our area. 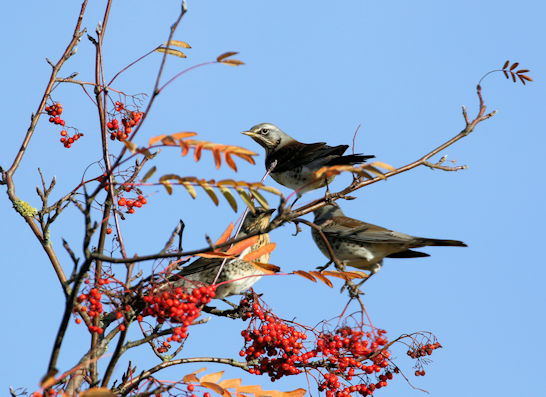 Yesterday I observed 32 Fieldfares flying towards the watch point at Caldene fields. I thought the birds would carry on their migration and fly over but they didn’t they needed to refuel and the next minute the birds had landed and were feeding on Rowan berries. The birds must have been very hungry as the trees were about 10 feet away!!! allowing some excellent photo opportunities. 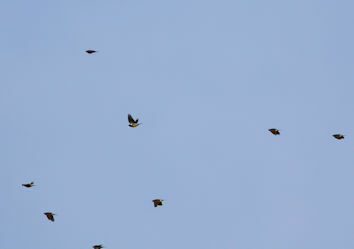 Toady there was another Wood pigeon movement with a total count of 5,963 recorded moving south. 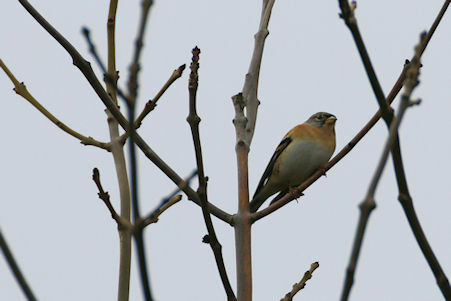 Also at least 28 Brambling were recorded moving to the S/W. Clare and Richard who are active members of the Low Moor & Oakenshaw Conservation Group came up with a brilliant idea!. 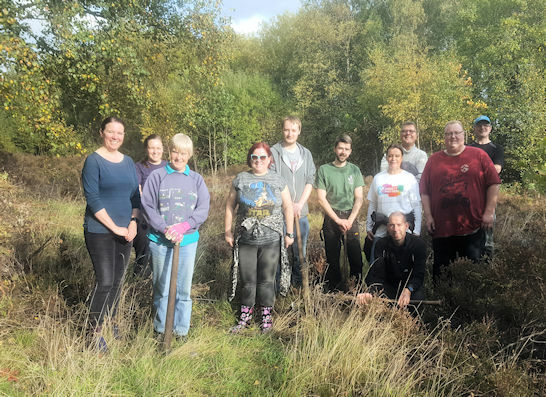 They contacted Yorkshire Building Society and asked if staff in the IT department would be interested in a conservation volunteering day at Toad Holes Beck and Raw Nook NR. The YBS kindly gave the thumbs up and Clare arranged a 09.30 start on Friday the 19th of October. 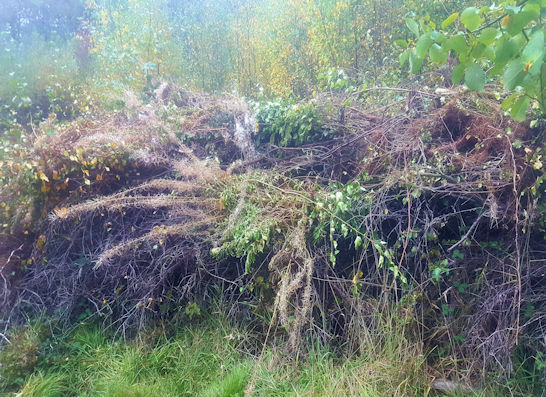 Work was firstly carried out at Toad Holes Beck which involved a general tidying up, Bramble clearing and spreading wildflower seed Yellow Rattle as invasive grasses have encroached into the meadow area. It was then time for a packed lunch at the local Woodlands cricket club who very kindly allowed the group to use their facilities. But the real hard work was about to start as the group then moved into Raw Nook NR. 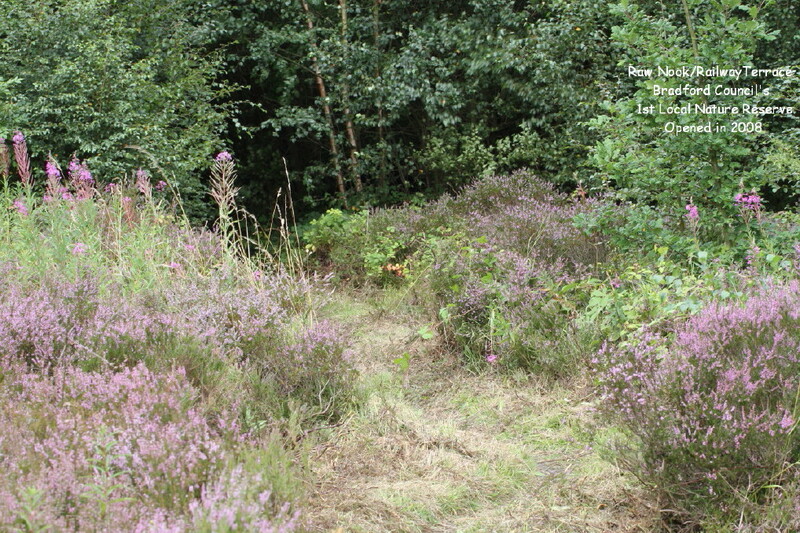 There were two jobs Clare and Richard had arranged one was to carry on digging up the Silver Birch saplings from the lowland heath habitat and the other was to try to establish the plant Yellow Rattle in the wildflower meadow. 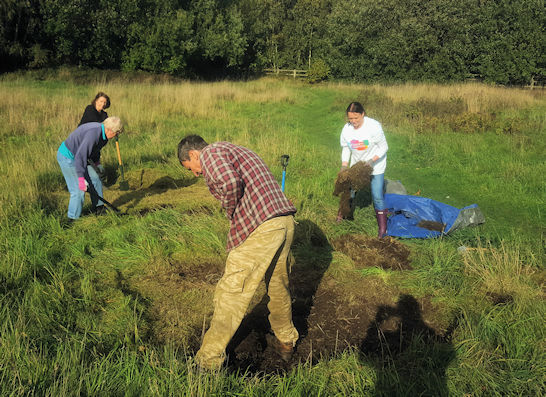 Volunteers stripping out 4 small areas of invasive grasses to create a habitat for Yellow Rattle to establish. A super potential wildlife bank which in spring will create ideal nesting habitats for local Robins, Thrushes and Wrens. But come on guys it’s a conservation day not an archaeological dig…as relics from the old Low Moor station were found..
Today like yesterday there was a large movement of Wood Pigeon, Jackdaws and finches particularly Chaffinch with a record count of 162 S/W and 42 N. However, today was a bit special as I had a wary friend as company a migrating Chiffchaff which stayed resting and preening for about 30 minutes at the watch point before moving off. It was an excellent morning at the watch point this morning with a mass arrival of Redwings, Fieldfare, Starlings, Geese and finches. 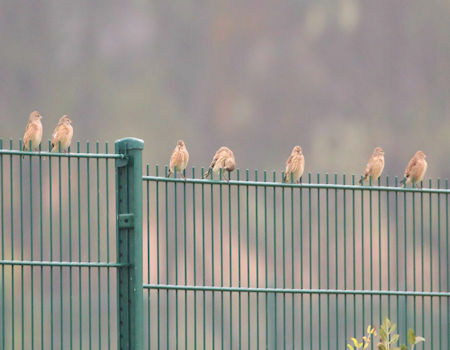 Linnets waiting for the fog to clear before moving. 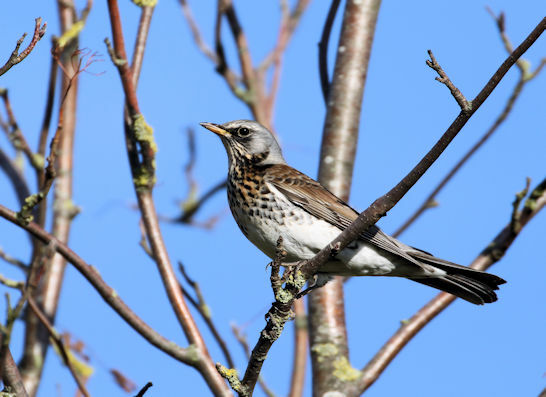 Redwings came in first from the N and a total of 4,076 moved to the S. Fieldfares came in 1,462 altogether around 10.00 and mainly from the S/E and moved to the S/W. There was a good movement of Pink-footed geese 1,167 in total and all to the N. A welcome surprise was a party of 73 Brambling that flew to the S/W. 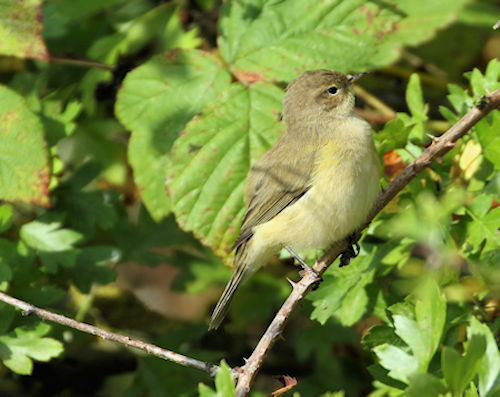 This morning was a stunning autumn morning for watching visible migration. And an early start in frosty conditions was rewarded with the first Thrush arrivals from the N/E involving Redwings and Fieldfares. 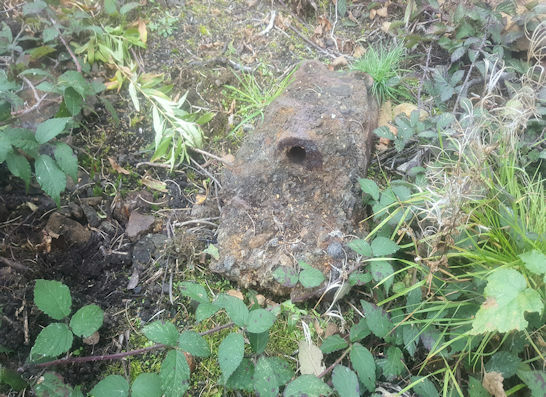 What a surprise this morning at the watch point at Caldene fields. I had just finished watching vis-mig ( visible migration ) when a bird came in low from the south….it cannot possibly be..it was a ” Kingfisher ”. 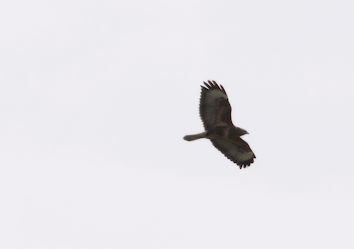 And more delightful it flew just over my head and carried on north. WOW! I never thought I would record a kingfisher on migration especially when the species rarely move from their territories and the bird is not local to our area. There was an excellent passage of Pink-footed geese noted from the watch point today. The main movement was observed to the east of Caldene fields with the majority moving to the S/W ( 964 in total) with 2 skeins (253 in total) moving to the N/W. Other highlights included a Great black backed gull which flew to the S/W and Goldfinches were all so on the move with 131 to the S/W and around 70+ feeding birds noted. After my stint at watching visible migration today I thought I would go into Raw Nook NR to see if I could ID any fungi that might be showing. However, my fungi knowledge is limited to say the least and if I found any would I be able to ID correctly? Well I was walking passed the pond to where the flooded woodland area is (on your right if coming from the bridge) when I noticed some orange bits that someone had thrown into flooded area. I walked into the area only to discover that it wasn’t orange peel but FUNGI which was orange. It was really unusual but beautiful at the same time.. I took photos and went home to investigate. 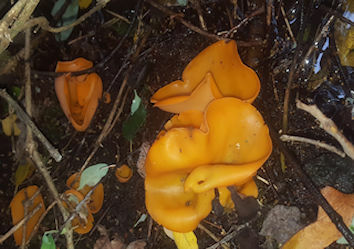 And I was right…well in a way it is an Orange Peel fungus Aleuria aurantia and is a site first for my records. Last night in Low Moor the weather was awful, a strong wind and lashing down rain. And Clare and Rich Stonehouse were walking home from work on Cleakheaton road just by the barbers at the opposite side of the road to the station. Suddenly their attention was drawn to a moth feeding on some pink flowers….but what was it. A closer look revealed only a stunning Hummingbird moth! Now interestingly this moth is mainly an immigrant moth coming in from southern Europe and this sighting coincides nicely with the strong southerly gales we experienced in the last few days. I have submitted this important sighting to Yorkshire moths on their behalf.